Nyingtik Saldrön (Tib. སྙིང་ཐིག་གསལ་སྒྲོན་, Wyl. snying thig gsal sgron) 'The Lamp that Illuminates the Heart Essence' — a guru yoga practice composed by Jamyang Khyentse Chökyi Lodrö at the request of Tsering Yudrön, a princess of Derge, and Dilgo Khyentse Rinpoche. Of all the guru yoga practices that he composed, this is considered the most special. 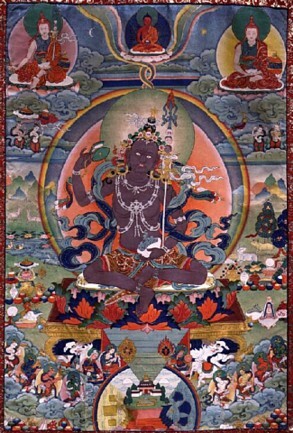 Jamyang Khyentse also wrote a commentary to the practice, called the Yeshe Saldrön. Grant me the blessings to change my mindstream, I pray! Jamyang Khyentse Chökyi Lodrö, Yeshe Saldrön (Tib. ཡེ་ཤེས་གསལ་སྒྲོན་; Wyl. ye shes gsal sgron), JKCL sungbum vol. II. Dilgo Khyentse Rinpoche, བསླབ་གྲོལ་ཡོན་ཏན་དགེ་བ་འཇམ་དབྱངས་རྒྱལ་མཚན་ལ་ཕུལ་བ།, bslab grol yon tan dge ba 'jam dbyangs rgyal mtshan la phul ba, Collected Works, vol. 3, pp. 467-470. Jamyang Khyentse Chökyi Lodrö, Yeshe Saldrön, 'The Lamp that Illuminates Wisdom'. Dilgo Khyentse Rinpoche, A Letter of Advice for Practising The Bright Torch of the Innermost Essence. ↑ There are different versions of this line. Some editions have Tib. དང་ dang, but according to the Gangtok edition of Jamyang Khyentse's collected works, the line ends in Tib. ཞབས་ shyap (Wyl. zhabs). Alak Zenkar Rinpoche has confirmed that this is the correct version. ↑ Different versions of the mantra are given in different editions of the text. Some version omit the syllable pala (Wyl. pha la), although this appears to be a mistake as the syllable does appear in the commentary. In addition, the commentary mentions the syllable only hung once, when it appears at the end of the mantra. This page was last edited on 22 December 2010, at 09:42.